my take: A small town saga set in Wisconsin, the novel is populated with a large cast of everyday characters - long lost cousins, a father & son, a mother & her illegitimate son, a grandfather and his sickly teenager, a mechanic and his pastor wife, a newly-released parolee and his parole officer. When I write my novel (let's be realistic NOVELLA) someday, I'd like to address the question "Can people change?" ... and the obvious corollary "Do they?" I think this novel answers some of my wonderings ... with an answer that sounds more like "people are onions." 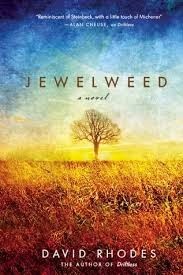 With themes of redemption, belonging, love, and reconciliation this quiet tale is a great read. I just found your blog and am loving it. I'm adding so many new books to my to read list and am enjoying your reviews on a lot of the books I've read already!! !